For the leisure class, "sports are an occasional diversion rather than a serious feature of life," wrote the social theorist Thorstein Veblen in his book The Theory of the Leisure Class, which introduced the concept of conspicuous consumption. Among sports, downhill skiing may be the most conspicuous of all, requiring ample leisure time, money, and environmental upheaval, so that individuals can sashay down a lift-served slope stripped of trees. "These sports," Veblen concluded, "as well as the general range of predaceous impulses and habits of thought which underlie the sporting character, do not altogether commend themselves to common sense." Cross-country skiing, however, is a decidedly less showy and destructive affair, and thus perhaps offers its adherents claim to a moral high ground, or at least the sturdy mantle of common sense. Cross-country skiers rely entirely on their own locomotion to traverse snowy terrain, without ski lifts or other forms of assistance. The sport's popularity soared in the 1970s, in concert with a reactionary trend of American asceticism coming out of the '60s, according to ski historian and US National Ski Hall of Famer John Fry. There were three main reasons for this: 1) cross-country skiing is much cheaper than downhill skiing; 2) it surpasses all sports in promoting cardiovascular fitness and muscle development; and 3) it embraces the natural environment. As Fry writes in The Story of Modern Skiing, cross-country skiers follow "trails deep into silent, commercial-free fir forests, hushed by the snow blanketing tree branches and the ground." The Lake Placid Club became the first American resort to offer organized cross-country skiing more than a century ago; since then, the sport has flourished in the mountains and backcountry of upstate New York. 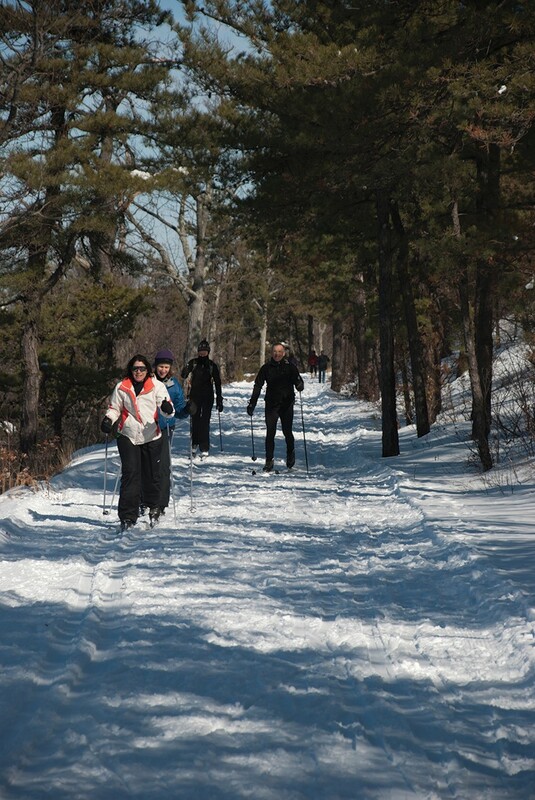 The Mid-Hudson Adirondack Mountain Club has been a vital steward of that legacy, and starting January 3, it will hold a series of beginner cross-country skiing workshops at the Mohonk Preserve in New Paltz and Fahnestock Winter Park in Carmel. Like last year, the workshops will be led by Marty Carp, a lifelong outdoorsman who estimates he's led between 700 and 800 classes, hikes, and other events for the Mid-Hudson ADK and the Appalachian Mountain Club. There are two basic styles in cross-country skiing. 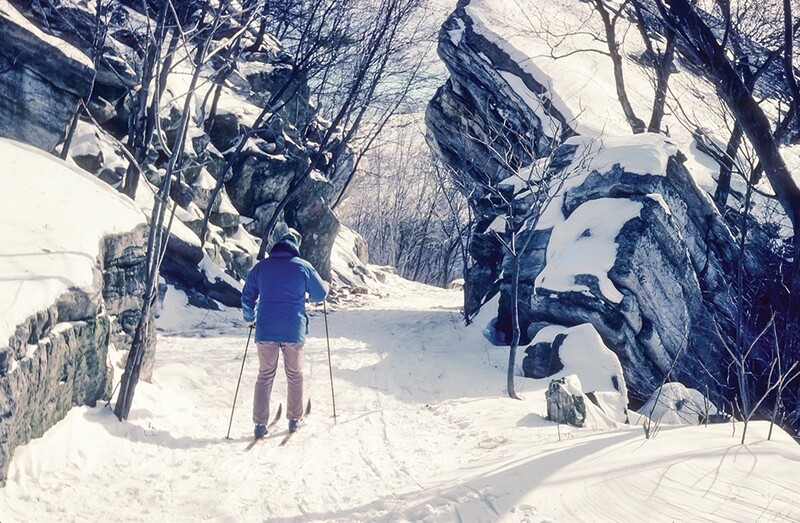 The Mid-Hudson ADK lessons focus on the classic technique, in which each ski is pushed forward in a sliding and gliding pattern, alternating foot to foot. This is the easiest method, and is well-suited for both unprepared terrain and groomed trails (pistes) like you'll find in the Mohonk Preserve. Skiers with waxed combi skis can also learn skate skiing, a technique in which skiers push alternating skis away from one another at an angle, in a manner similar to ice skating. It can only be done on prepared runs, and the equipment differs from classic gear: Poles are slightly longer, skis shorter and narrower, and boots higher and stiffer. In general, skis used in cross-country are lighter and narrower than those used in downhill skiing, with free-heel bindings (meaning the boot is attached to the ski only at the toe). Poles are slightly longer, because additional length provides more propulsion across flat surfaces. That's also why it's important to choose poles specifically designed for cross-country skiing, as opposed to telescoping trekking poles used in hiking: You'll be pushing hard off them, rather than just leaning on them for balance. The best way to maintain the right posture for cross-country skiing, Carp says, is to think of yourself as a gorilla running. That will keep your body hunched forward, knees bent, your weight on the balls of your feet, and your arms and legs moving in a diagonally alternating rhythm. "It loosens people up, too," Carp adds, "and gets them into the more instinctive mode required for cross-country skiing." As for clothing, since you won't be flying downhill, Carp says a wool beanie or headband to keep your ears warm should suffice for headgear. Dress in light layers for warmth and flexibility, with a durable, waterproof outer layer, such as a soft-shell jacket or windbreaker. Pair wool or synthetic socks with ankle gaiters to keep snow from getting inside your boots. Any breathable outdoor glove of your choice is fine, though Carp advises beginners, who tend to fall down and get their gloves wet, to bring a second pair. Carp is an effusive champion of cross-country skiing as a sublime way to experience the winter environment, comparing it to "eating an ice cream cone all day" and quoting the pioneering Norwegian skier Herman "Jackrabbit" Smith-Johannsen's maxim of "ski, ski, ski!" to describe his impulse to continue doing it year after year, even at the age of 75. "I love standing on top of a hill on my skis with my poles in the ground," he says, "just pausing to take it all in, and loving what I'm doing." Who better to guide the beginner? January can be a frustrating month for cross-country skiers. 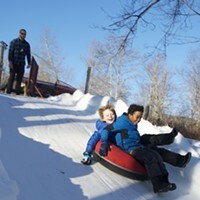 It’s often the coldest month of the year, but snow conditions can be sub-optimal. Here are some resources for novice cross-country skiers before they make their first foray into the snow. Rock and Snow (New Paltz)—they also have a consignment section, where you can find inexpensive gear. Potter Brothers—multiple locations: Kingston; Fishkill; Killington Resort, VT; Bromley Mountain, VT.; Jiminy Peak, MA. Check weather and snow conditions before you head out. Freshly fallen snow is ideal for skiing. Crust—formed when the top layer melts and refreezes—is difficult. 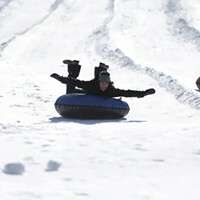 Slush and ice are not good conditions and should be avoided by beginners. Start with groomed trails while you’re learning. Go during the week, if possible. The best ski locations get extremely crowded on weekends. Bring a pack with extra clothing and accessories. You’ll be outside in the elements for a long time, so bring extra gloves, lip balm, tissues, water, and snacks in a small daypack. Bring wax. Glide wax is applied to the base of your skis once or twice per season (you can have a professional do it the first time). Grip wax (aka kick wax) is applied to the kick zone, which is the area on the bottom of your ski from your heel extending six inches beyond your toes. There are a range of types covering different temperatures, and it needs to be applied each time you hit the trail. Keep your skis tuned. Your local ski shop can make sure your skis are tuned, which includes base repair, edge work, and waxing.